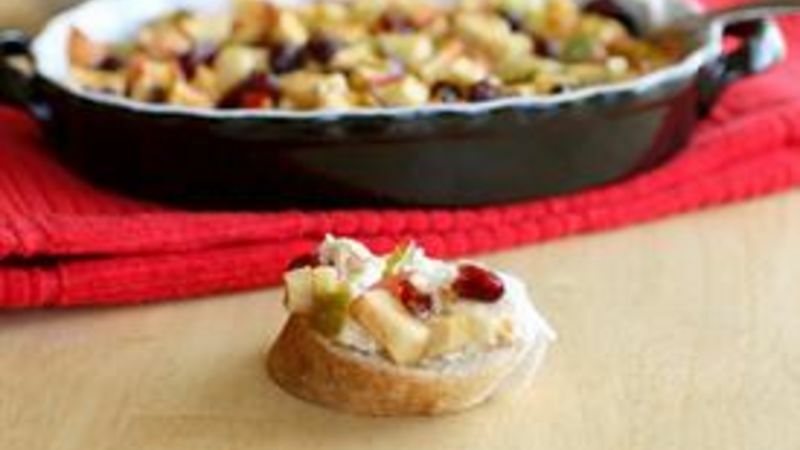 In a medium bowl, combine the chopped apples, jalapeño, and dried cranberries. Add the apple jalapeno jelly and stir to combine. In a small baking dish, spread the cream cheese on the bottom in a thin layer. Pour the apple mixture on top. Bake for 20-25 minutes or until mixture is heated through. Serve by spreading over sliced crusty Pillsbury™ French loaf. Serve immediately. This appetizer recipe is festive with bright red and green apples -- perfect for your New Year's Eve buffet! When it comes to appetizers, it feels like we’ve all gotten into a rut of the same old dishes. But this Hot Apple and Jalapeno Spread is a not only festive with bright red and green apples, but completely different from typical appetizers. Start off with giving your apples and jalapenos a good chop. You want to keep the skin on your apples here for bursts of color. Make sure you dice your jalapeno finely because no one wants to bite into a big chunk of jalapeno and have their mouth be on fire! Then add some dried cranberries and some apple jalapeno jelly to bind it all together. If you can only find regular jalapeno jelly, that works too. Next, using a shallow crock or baking dish, spread a thin layer of cream cheese on the bottom -- because, in my opinion, cream cheese makes everything better! Then pour on your apple mixture and pop it in the oven. Once it’s all warmed, serve it over a loaf of sliced Pillsbury crusty French bread. I was a little worried that between the jalapenos and the jalapeno jelly this dip would be too hot for my taste, but it ended up being pretty mild. The sweetness of the apples compliments the spiciness of the jalapenos. Enjoy this warm and festive appetizer this holiday season!